Comprehensive review of Bella Beauty Retinol Serum. See how this retinol cream compares against other wrinkle creams! I found Bella Beauty Retinol Serum to be pretty unimpressive as it did basically nothing for my skin, and definitely didn’t help with anti-aging. When I first applied Bella Beauty Retinol Serum, I noticed that the texture of this product didn’t feel like a serum at all, but more like I was applying water to my skin. The super liquidy serum applied very easy to my skin, and a little bit went a long way. The bottle has a dropper applicator and I would say you only need about 2 drops at the most to cover your entire face and neck. Once it’s applied on to the skin, it absorbs and dries very quickly and leaves no trace of product at all on the skin. The morning after using Bella Beauty Retinol Serum for the first time, my skin felt a bit more hydrated than normal, but other than that, there weren’t any other noticeable differences. After using the product over a longer period of time, I didn’t see any significant changes to the fine lines and wrinkles on my face. Actually, I didn’t see any improvement to the fine lines and wrinkles on my face. My skin did feel soft and moisturized but that’s nothing a good moisturizer can’t do. Overall, Bella Beauty Retinol Serum didn’t help with the fine lines and wrinkles on my face, and I wouldn’t recommend it for anyone looking to help with anti-aging. The texture of Beauty Bella Retinol Serum feels much different from a lot of other serums; it feels very much like water or a thin liquid. When you rub it into your skin, the texture doesn’t change at all; it feels completely like water and absorbs right into the skin. Bella Beauty Retinol Serum is easy to apply. It has a dropper applicator that makes it easy to control the amount of product dispersed. Because of the super thin and liquidy consistency of this product, it’s really easy to apply to the skin, and only requires about 2 drops to cover the entire face and neck. Bella Beauty Retinol Serum dries very quickly within about 10-15 seconds. Once the product is dry, the product is completely undetectable on this skin; there is no feeling or texture left. There is literally zero smell to this product at all. The morning after using Bella Beauty Retinol Serum for the first time, my face felt a bit more hydrated than normal, but there were no drastic changes to my skin. After using Bella Beauty Retinol Serum for a longer period time, I didn’t see any improvements in the fine lines and wrinkles on my face. I noticed that when I used this product, my skin felt moisturized and soft, but I saw no noticeable differences in the wrinkles or spots on my face. I also noticed that this product clogged my pores a bit, and I was getting more breakouts on my cheeks than I normally would. Bella Beauty Retinol Serum is a mostly natural and organic product which I really appreciate, and contains Vitamin E, Hyaluronic Acid, and Green Tea, all of which are supposed to be great for anti-aging. Vitamin E is meant to help with anti-aging by targeting free radicals and blocking them from aging the skin. Next, Hyaluronic Acid helps the aging process by locking moisture into the skin and keeping it hydrated. Finally, Green Tea has strong antioxidants that help keep inflammation at bay as well as fights wrinkles and aging by increasing cell turnover in the skin. These three ingredients combined should work very well to fight aging of the skin. 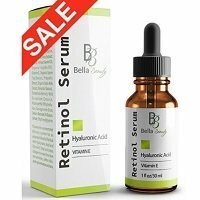 The cost of Bella Beauty Retinol Serum is $14.99 for 1 oz of product. This is an average to slightly above average price for a retinol product. Unfortunately, I couldn’t find a money back guarantee for Bella Beauty Retinol Serum. To Bella Beauty Retinol Serum, click here. Ingredients Green tea is great for inflammation.